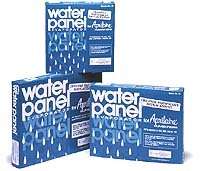 These types of Water Panels can be used in a variety of Aprilaire Humidifiers, Chippewa Humidifiers and Lennox Humidifiers. Check with each individual listing for the correct Water Panel for your model. Installation instructions are on the back of the package. Aprilaire recommends that the Water Panels be changed annually for homes with soft water and more often with homes with hard water.